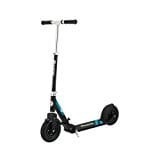 So before you read the rest of this review, if you want to see our full list of premium adult kick scooters then go to the adult kick scooter comparison page. 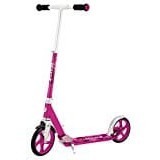 I've looked at all of the best of adult kick scooters including the Razor A5 Lux featured here. So now for a rundown of the various Razor A5 Lux models because they are different enought to warrant a comparison. For example, the Carbon Lux does not fold and the A5 Air has air tires and a more sleek look. Click on the links in the table to buy that particular model. All prices are the live lowest price as provided by Amazon. Low resistance polyurethane 8.5 lbs ABEC-5, high performance self lubricating 200.0 mm 28.3" Front and rear fender No 6 months warranty against manufacturing defects. Does not cover normal wear and tear, tires, tubes or cables, or any damage, failure or loss caused by improper assembly, maintenance, or storage. ABEC-5, high performance self lubricating 8.5 lbs ABEC-5, high performance self lubricating 200.0 mm 28.3" Front and rear fender No 6 months warranty against manufacturing defects. Does not cover normal wear and tear, tires, tubes or cables, or any damage, failure or loss caused by improper assembly, maintenance, or storage. Pneumatic (60 PSI) commuter air-filled tires 11.1 lbs ABEC-5, high performance self lubricating 200.0 mm 28.3" Front plastic and rear metal fender No 6 months warranty against manufacturing defects. Does not cover normal wear and tear, tires, tubes or cables, or any damage, failure or loss caused by improper assembly, maintenance, or storage. ABEC-5, high performance self lubricating 10.7 lbs ABEC-5, high performance self lubricating 200.0 mm 28.3" Rear fender No 6 months warranty against manufacturing defects. Does not cover normal wear and tear, tires, tubes or cables, or any damage, failure or loss caused by improper assembly, maintenance, or storage. 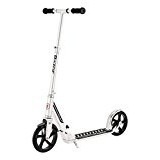 Now don’t laugh at this particular review, but you might be wondering why a 40 something would actually review a Razor A5 Lux Kick Scooter and then be recommending it as an adult ride on…but I am and it rocks. 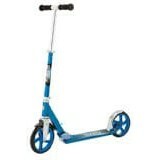 It is a slight upgrade from the Razor A5 Scooter and great as an adult ride. 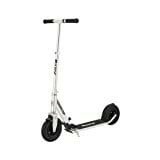 After riding one of these for a while, you will understand like I did that there are nothing but advantages to an adult riding one of the best adult kick scooters out there. This little beauty is the perfect mix of sport styling and adult cruising. 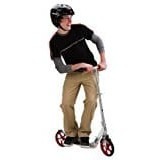 With it's larger wheels it can go faster for commuting and so should not be confused with the tiny-wheeled stunt scooters or kids scooters. I don’t like taking my bike because by the time I get there the bike racks are usually full up. Then to have to take the bike on the rush-hour commuter train just gets me death stares for the next hour. So, my solution, get a kick scooter. 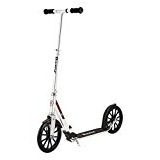 I had tried my son’s Razor A3 scooter (which I will review soon) with the small wheels and although I liked the build quality, the smaller wheels meant I felt every little bump in the sidewalk and the steering was very sharp if you know what I mean. 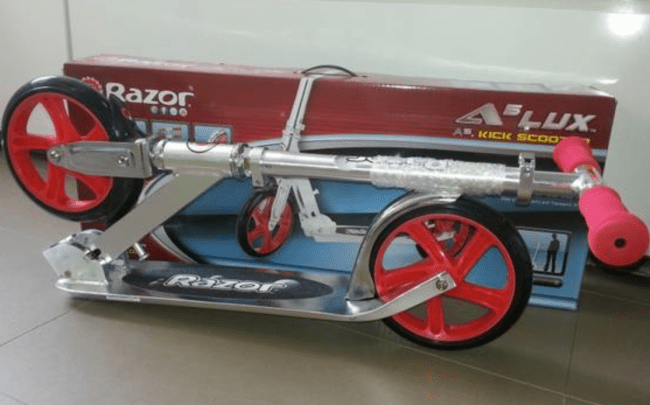 So in this first of a series of best Razor kick scooter reviews, I will admit that when I saw the Razor A5 Scooter Lux model with its out-sized wheels (at least compared to what I had seen before) I had to give it a go. When you first unbox your Razor A5 Lux it is always best practice to go round and tighten up everything and make sure that the steering tube and the collar clamp are secure as otherwise it will feel a little rattly when you are riding it. The Razor A5 Lux folds up really nicely as well and light at only 10lbs or 4kgs. The body is made out of aircraft grade aluminium which holds my weight (198lbs or 90kgs) without feeling like I will break it. I have not seen any stress fractures or sign of wear! As expected the larger wheels make a huge difference, I can now ride over cracks and bumps with ease. Although you do need to avoid the bigger cracks! The wheel or tire is made of urethane, the same stuff that skateboard wheels are made of, so you get fantastic grip and a smooth ride that seems to glide for ages on a single push. The great thing about urethane is that it so durable and will last a long time being ridden on asphalt. The A5 has fender brake that you stand on to stop or slow the scooter, however I have noticed that in wet weather it does not work as well. I should also warn you that the fender brake does get hot especially if you are using it to control your speed when you are going downhill. 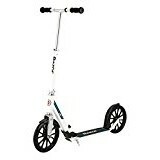 I think that overall this is a great kick scooter product for both adults and kids as you can adjust the height of the steering column easily, but I would not recommend it for a child under 8 years old. Perhaps even 10 years old would be the minimum age, depending on the kid's height. My one gripe in this best of kick scooters review would be that handle bar grips are spongy and don’t give you that much confidence, so I changed them over with bicycle grips which give me a better and more solid grip. But that is just a personal preference, you may not feel the same way about the grips. Oh and it would be really nice to have some fitted strap so that you can just sling it over your shoulder when not in use! 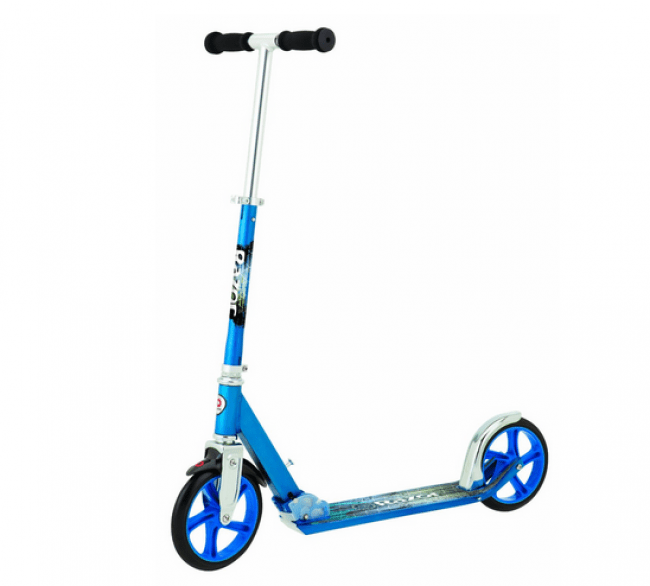 Other kick Scooters in the Razor range include the Razor A scooters which have the smaller 98mm wheels that most people are familiar with and these are great for kids from 8 years old. This is what my boy has and he loves it. It comes with the ABEC bearings which are right up there in terms of engineering tolerance so the ride is super smooth and allows for a heavier person to ride them in comfort, again up to 220lbs or 100kgs. They come in very cool color combinations and again are made from aircraft grade aluminium so they are super rugged and will take whatever your child throws at it. Mine throws it around like he is trying to break it! that I do promise you. Recommended accessories are helmets, knee pads & elbow pads because if your kids are anything like my 10 year old they will come back with scrapes and bruises all over themselves. My son never wanted to wear the elbow pads but after a few falls and he was wearing them all the time. The knee pads also save their pants from getting ripped at the knees which is another expense that hard working parents can do without. Coming up soon...I will post some reviews and guides to helmets, knee pads & elbow pads for safety first! 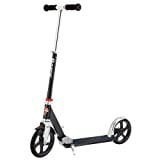 Let's be clear, we think the Razor A5 Lux Scooter is the best adult kick scooter for commuting because it is amazing value for money and we highly recommend it for both price and quality - never take the bus to work again! 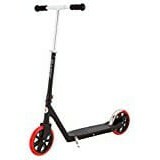 I hope you enjoyed my review of one of the best kick scooters for adults - if you know this scooter or alternative models go ahead and leave your own comments below! I wrote a review on the Razor A5 Lux if anyone's interested at http://kickscooter.org/razor-a5-lux-scooter-review. Thats a Great review Kscooter - thanks! There is certainly no one size fits all when it comes to adult kick scooters! 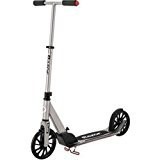 Great scooter for the money..
Just out of curiosity, are the tires able to be replaced with air filled tires so that they ride over bumps better? Or are the urethane ones better? Hi David, it's difficult to replace the tires on the A5 Lux because of the Fender clearance on the front and back wheels. You would be better off getting the Razor A5 Air model at the top of this page that comes with factory-fitted air tires. Is the Phase Two The Best Razor Dirt Scooter? We Take A Look! Are Maxi Micro Scooters Worth Their Expensive Price Tag?